Egos are left at the door at this unpretentious Valley gem. It’s where you’ll find a diverse community filled with people that won’t judge if you roll right out of bed into class. 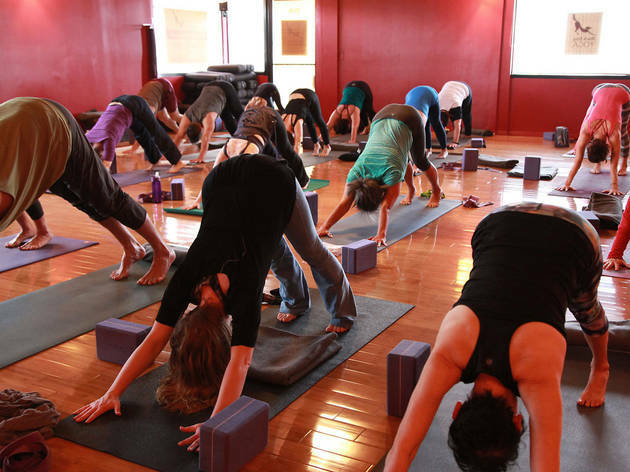 Over 80 classes a week, from traditional basics to powerful advanced are held in four vibrantly hued asana rooms. Monthly specialties like Vino and Vinyasa feature live music and a place to make friends. They walk the walk on giving back; donation yoga led by training graduates benefits NKLA, and 11th Step is a format that integrates 12 steps of AA into the practice. The military gets love too; active duty and vets flow for free. Stressed at work? Pop in for a $10 lunch flow; see schedule for times. Mats, tea and WiFi are free. The outside hall bathroom is a minor con. Parking (on-site/street) is easy for Ventura Boulevard standards.